The above diagram shows the names of the fundamental notes on the guitar. The notes follow the first 7 letters of the English alphabet, ie A B C D E F and G. It is important for a guitarist to be completely familiar with the names of all the notes, beacause it leads to an understanding of how scales and chords are structured. For example, fret No 7 on string No 5 is E and fret No 3 on string No 4 is F. In Guitar parlance, a movement of 1 fret higher or lower in pitch is a SEMITONE. and a movement of two frets is a TONE. Notice that E and F are a semitone apart, B and C are a semitone apart but all the others are a tone apart. Where there is a gap in the above chart we use the terms SHARP (#) which means a semitone (1 fret) higher in pitch and FLAT (b) which means a semitone lower than. 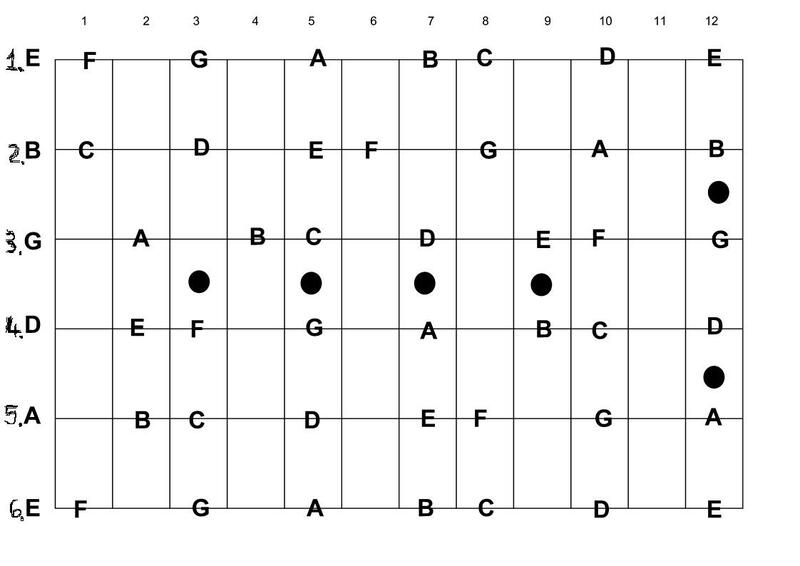 So the note at fret No 2 on string 6, for example, could be either F Sharp (F#) or G Flat (Gb). The same applies to all the other notes where there are gaps. For a practice exercise, staring on string 6, play the open string and say "E" loud and confidently to yourself. Then play fret 1 and say "F", fret 3 and say "G", fret 5 and say "A", fret 7 and say "B", fret 8 and say "C", fret 10 and say "D" and fret 12 and say "E". Repeat this for the other 5 strings and do this regularly and often until you are confident you know the names of the notes. Notice, too, that when you rise in pitch from the open 6th string, when you come to fret 5 (A), this is exactly the same note as the open 5th string (A). So there are 2 possible positions for playing this note and this is one method of tuning the guitar. If fret 5 on string 6 and the open A string are not identical in pitch, then you need to adjust the tuning of one of them util the notes are identical. The same applies to the open 4th string (D), which should be identical to fret 5 on the 5th string and fret 10 on string 6. There are thus 3 possible positions to play this note. Fret 5 on string 4 should be the same note as the open 3rd string (G). Fret 4 on string 3 should be the same note as the open 2nd string (B). Fret 5 on string 2 should be the same note as the open 1st string (E). One of the oldest methods for writing down music for stringed instruments, guitar TAB is easy to understand. Six horizontal lines represent the strings and the numbers on a particular string mean that that fret is to be played. Read from left to right and play the notes in order. For example, the following is "Mary had a little lamb", using string 5. Play the open string, followed by fret 2, fret 4, fret 5, fret 4 again, fret 2 again and the finally the open string. Practice it until it is perfect and do not rush in the beginning. Many beginners make the mistake of trying to play too quickly and therefore the result sounds rushed and hasty, Aim for a smooth, steady flow of notes.